im The proud new owner of a 1952 Huckins Seafarer 40. She was substantially rebuilt by Crocker's boat yard in 2008 . The previous owner made a couple of modifications - actually quite a few most of which I like and one in particular I hate which is a mast . So the Mast is gone. Since the refit the boat seems to have been left pretty much dormant so the past couple years have not been kind to her cosmetics - but the bones are fantastic . I've been looking at Huckins for more than 20 years and I finally have my dream boat so I'm very excited . I'll post pictures from time to time of my progress but I'm very intimidated by the level of talent on the site . Congratulations! (Or maybe condolances? ) I know absolutely *zilch* about the type, but hearing that you've found your dream boat is relly great. Ordinarily I like masts, for mounting electronics and for a boom to bring a tender aboard, but yes, you're right, she's much better without the mast. Good call. Congratulations LISC! That is a seriously beautiful Huckins. I had a 1946 Offshore 48 for many years. It was a restoration project that ended badly (gory details elsewhere here if you care to hear about it - just search for "Perihelion") but I still love the boats. What does she have for power? Also, I completely agree with removal of the mast. And I sure hope that cabin top was reinforced for it otherwise you might get problems there. That's a very light structure, not intended to support much weight. Chris Ive lurked on this site for a while and read your sad story- condolences. She's powered by 2 new small block Crusaders 330 HP and cruises at a solid 21 to 23 knots at one nautical mile to the gallon. 2. Leave all unnecessary gear ashore. I think that's about the perfect setup for that boat and I suspect FPH would have approved. If you get a chance, post video of her running at speed. I'd love to see it! Beautiful! Definately agree,...that mast on a Huckins really makes one say Huhhhhh??????.. what were they thinking?? looking forward to your updates. She is an iconic boat. beautiful! we need more pics. what are your plans for it, or are you done ? I love Huckins! Can't wait to see more! glad she is in caring hands, will be interested to see how you handle refreshing the interior, I think Huckins epitomize a certain austere, functional beauty often lost when the interiors are plushed out and overdone. Saw a great example of an original looking Huckins in Dering Harbor on Shelter Island last summer, looked like it might have been a patrol boat for an elegant navy. My grandfather had one of these Huckins in the forties and fifties. I barely remember it, but ten years before I was born he was aboard the boat (1942) when a year to the day after his wife passed away, my dad had to tell him that his oldest son (my dad's only sibling) had gone missing in the Mediterranean flying a Hurricane from Malta to Italy. He was never found and my dad says it was the saddest thing he ever had to tell his father and the worst day in his family's life. Congrats on the new boat, LISC. I hope she serves you well for many years. In your quest for authenticity as you refurbish it, don't hesitate to contact Mother Huckins. The owners of the company, Cindy & Buddy Purcell, are very nice folk who are strongly dedicated to keeping in touch with, and helping, all Huckins owners, not just their next customer for a new boat. They also keep pretty good records of all their past boats. 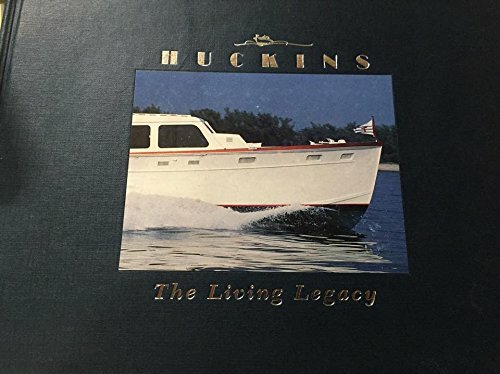 They published a book about the history of Huckins Yachts - Huckins: The Living Legacy - that is a very entertaining read. Wonder how much she likes that flying bridge? I just think a machine gun would be cooler. I have a copy of the Huckins Book and my boat was featured as "Lowashawa". Apparently Little Joe is the 3rd name. Frank Huckins hated flybridges apparently and none were fitted to the boats until after his death (sometime in the late 50's I believe). I admit the boat would look better without the flybridge but it really adds to the experience so it's going to stay. Not just that but it was properly constructed in foam-core composite at God-knows what expense in 2008. I am committed to keeping her light so I wont add weight without taking weight out ( a challenge to myself). I've already carted hundreds of pounds of miscellaneous stuff off of her. LISC, it sounds like the work for the flying bridge was done right, but one thing you might want to check is whether the cabin top beams were reinforced at all? If your cabin top is constructed the same way as the one on Perihelion it is probably not strong enough to support people walking on it regularly. The beams for Perihelion were 3/4" x 3" laminated oak, and both the bridge hard top and the trunk cabin top had flattened out and started to sag. Once that happens it's tricky to restore the original camber to the top. We ended up rebuilding the cabin tops completely. Good call. The cabin top was apparently strengthened at the time the bridge was added. I have blue prints from a Jacksonville based naval architect detailing the project. (his name escapes me at the moment). By the way I enjoy reading about your progress with Petrel, she's a pretty boat. well Ive started some cosmetic work. I'm keeping the boat in the water this winter (in CT) and I had the yard build me a pretty substantial shrink wrap tent so I can start to attack the paint work on the house and mid and aft cockpits. It's nice and warm in there seemingly about 10 degrees above ambient in the sun - of course we'll see about that in February! The boat is painted entirely with awlgrip some in decent shape, some not. I'm actually keeping a time log so I can keep track of the value of the work, probably ill-advised but I have a tendency to go overboard ( bad choice of word?) with projects like this and I want to keep myself honest. I got a quote from a local painter to just paint the house and the cockpits and he hit me at $20,000 and when the color left my face he revised his bid to $16,000 and needless to say that's not a consideration. I'll be doing the work myself, one section at a time so I don't end up with an unusable boat in the spring if anything takes much longer that I'm anticipating. I am "wooding" the areas that are peeling and starting from scratch preferring to do things right rather than often. this week I logged 18 hours stripping all the cockpit walls to wood, first with a heat gun and scraper and finally with my new to me Festool sander and vacuum. By the way, that Festool is about the nicest tool I ever bought myself and well worth the money in my opinion. I filled a black garbage bag with about 20 lbs of paint chips. I think a lot of the awlgrip failure ( checking and peeling) was due to the fact that it was applied over some sort of surfacing primer on top of the original alkyld paint. One panel was entirely floated with a skim coat of bondo which was a $&@$ son of a gun to remove - the bondo having about the same density as the wood underneath made for some unwanted wood gouging with the putty knife. By the way, I found that getting the putty knife very hot made the job easier. the top sides are constructed of plywood which is checking in places and where ever the paint was cracked, the plywood is checked to a degree. I'm not sure what came first, the failure of the paint, leading to moisture intrusion or the checking, leading to paint failure. The paint that I removed was generally about .050 thick. Yes really thick. my plan (advice welcome) is to seal the plywood with two coats of West System Epoxy to fill the checks and then follow up with awlgrip primer and top coat, rolled and tipped. The Awlgrip application guide seems to favor Awlquick primer instead of their 545 epoxy primer for ease of application with a roller v. spray. I'm wondering if anyone has direct experience with either? im including a picture of a cockpit cubby door which was peeling badly. Currently it has one coat of epoxy on it but you can plainly see the dark areas which are the checks and exactly where the paint was peeling. The ply panel looks in the pic to be Doug Fir ply? If so, you need to know that it checks, relentlessly, and no paint system will stop it. Glass overlay in epoxy is the only way I can get it to hold a finish, primer and awl grip over. The checking problem is a combination of the lumber (Doug Fir) and the process, (peeled veneer). I recognize that this suggestion doubles the work and expense, but that's been my experience over 40 years or so. Where I have had un-glassed DF ply to maintain, where glassing is not an option, regular alkyd enamel, yearly, its a process not a finish. Appearance is not the same, of course, but Awlgrip on unglassed DF ply is a heartbreaker. Thank you BBgood. I don't want to paint every year so I'm taking your advice to heart. Having said that, the Awlgrip took 10 years to fail in this case and I don't think the surface was properly prepared- and that's being kind. I'll take some photos today of some different panels that are not nearly as bad. I posted a picture of the worst one because that's what I had at home. Do you think my idea of epoxy saturation as a prep. has any merit at all? If I go ahead with cloth, what's the lightest you think I could get away with - I'm thinking 4 oz for ease of application. Thanks! Good point erster. Here's some photos of the larger panels which weren't as bad. All in all pretty good for 65 years old. LISC - nice boat. I think the picture of the Ortega is just up i95 from you at Palmer Landing in Stamford. Looked like Beighleywick. I would agree that it wasn’t the paint, but the substrate. Also, I would be very careful with that shrink wrap. You might get a lot of condensation lying on the toerail and stern varnish unless it is held off the hull and really well ventilated. If you plan on awlgrip, please be careful with the fumes. That stuff is beyond toxic. It makes me feel ill being anywhere near it nowadays. You might also consider something life Awlcraft or Alexseal. A little softer, but wet sand able/polishable and repairable. Congratulations on on the boat, she’s beautiful. I agree with SailAR - ventilate the shrink-wrap. I hear you guys on the shrink wrap. I would normally be very uncomfortable having the wrap on the transom like that - but it needs to be wooded and re-done in the spring anyway. If you look at the picture you'll see that its blotchy from being sanded to the wood in a few areas. Also I don't think "Little Joe" is a great name and since it's the 3rd one, I'm not superstitious about changing it. It seems too hard to be phenolic varnish, I think its a urethane - so I think it should be ok, but I'll keep an eye on it. BTW SailAR, thanks and I agree on Beighleywick, she used to be moored at Stamford Yacht Club during the season. I looked at her in Jacksonville in the 90's when she was named Just Katherine. BBG thanks for the feedback. I think in the cockpit I'll try my idea of the epoxy soak - its protected by a hard top, and on the cabin sides I'll go with the 4 oz cloth. Honestly if I'm doing it right and wooding the house sides anyway, it shouldn't be a horrendous amount of extra time.